Clarifying the physicochemical properties of nanomaterials is crucial for hazard assessment and the safe application of these substances. With this in mind, we analyzed the relationship between particle size and the in vitro effect of amorphous nanosilica (nSP). Specifically, we evaluated the relationship between particle size of nSP and the in vitro biological effects using human keratinocyte cells (HaCaT). 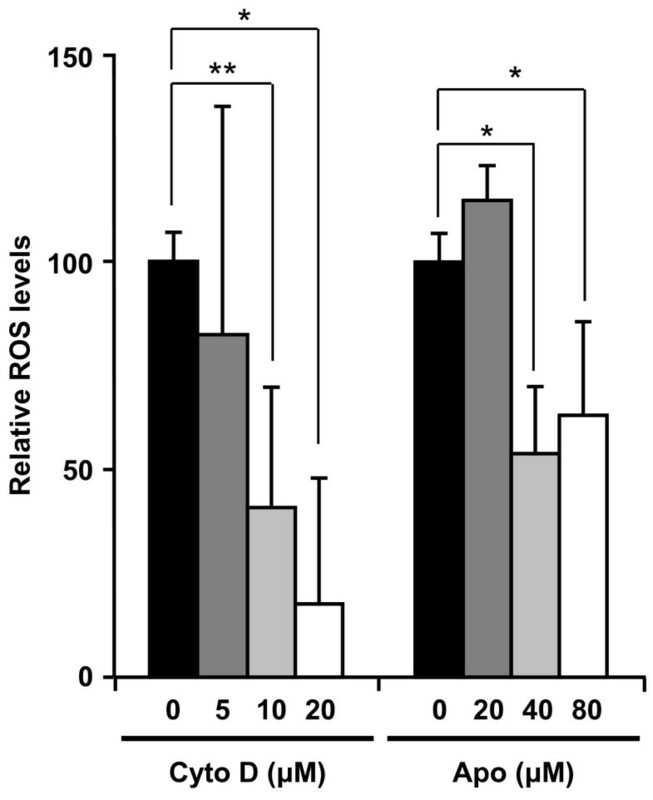 Our results indicate that exposure to nSP of 70 nm diameter (nSP70) induced an elevated level of reactive oxygen species (ROS), leading to DNA damage. A markedly reduced response was observed using submicron-sized silica particles of 300 and 1000 nm diameter. In addition, cytochalasin D-treatment reduced nSP70-mediated ROS generation and DNA damage, suggesting that endocytosis is involved in nSP70-mediated cellular effects. Thus, particle size affects amorphous silica-induced ROS generation and DNA damage of HaCaT cells. We believe clarification of the endocytosis pathway of nSP will provide useful information for hazard assessment as well as the design of safer forms of nSPs. With recent developments in nanotechnology, various kinds of nanomaterials have been designed and produced throughout the world. Nanomaterials have been widely used in consumer and industrial applications, such as medicine, cosmetics and foods, because they exhibit unique physicochemical properties and innovative functions . For example, materials such as amorphous silica nanoparticles (nSPs) and titanium dioxide (TiO2) are colorless and reflect ultraviolet light more efficiently than micro-sized particles. Consequently, these substances are already used as functional ingredients in many cosmetics such as foundation creams and sunscreens. However, concerns over the potentially harmful effects of nanomaterials have been raised precisely because they possess novel properties that are different from those of microsized materials. Increasing numbers of studies show that many types of nanomaterials, such as carbon nanotubes, fullerenes, quantum dots, zinc oxide and TiO2, have a harmful effect on cells and rodents [2–14]. For example, previous studies reported that various nanoparticles induced toxicological effects mainly in lung, liver, spleen and kidney tissues [3, 10, 15–19]. In vivo toxicity studies in Sprague Dawley rats showed that inhaled silver nanoparticles elicited chronic inflammation in the lungs . After intravenous injection with silica nanoparticles in BALB/c mice, 70 nm particles induced liver injury at 30 mg/kg, while 300 nm or 1000 nm had no effect . Recent evidence indicates that the small size and high surface area of nanomaterials may cause unpredictable genotoxic properties . For example, induction of DNA damage by gold-, silver-, cobalt-, TiO2-nanoparticles has been reported. The results from various studies suggest that these nanomaterials may cause DNA damage by an indirect pathway through promoting oxidative stress and inflammatory responses via dysfunction of mitochondria or inflammasomes. Central to the study of nanotoxicology is genotoxicity, the study of genetic aberrations following exposure to nanomaterials, because it is known that an increased genetic instability is associated with the development of cancer. A sufficient understanding of the relationship between the physicochemical characteristics of nanomaterials governing their cytotoxicity (i.e. genotoxicity) and the identification of factors that influence their associated hazards are essential for the development of safer nanomaterials [22–25]. Since the linkage analysis is the sole methods for developing safe nanomaterials, many researchers have conducted extensive efforts [26–30]. In this context, the aim of our study was to investigate the relationship between particle size and in vitro hazard of amorphous nanosilica (nSP), especially focusing on DNA damage, using human keratinocyte cells. We first analyzed the physicochemical properties of the commercially available silica particles of 70, 300 and 1000 nm in diameter (nSP70, nSP300 and mSP1000, respectively). Close examination of the silica particles of different particle sizes (nSP70, nSP300, mSP1000) by scanning electron microscopy (SEM) revealed that all the particles used in this study were spherical and the primary particle sizes were approximately uniform (Figure 1A-C). The size distribution spectrum of each set of silica particles in a neutral solvent showed a single peak. Moreover, the average particle size corresponded almost precisely to the anticipated size for each sample (Figure 1D and 1E). These results suggest that the silica particles used in this study remained as stable well-dispersed particles in solution. Scanning electron microscopy (SEM) analysis and spectrum of size distribution of amorphous silica particles. 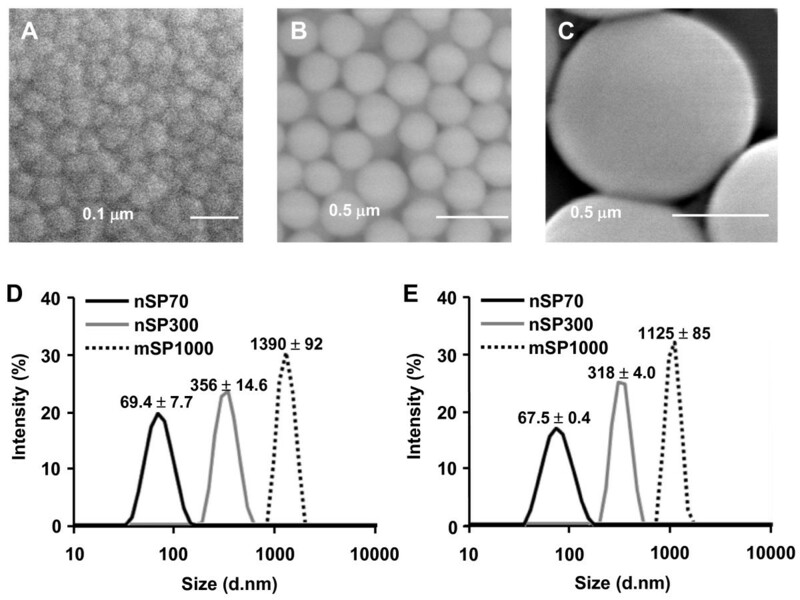 (A-C) SEM photomicrographs of silica particles used in this study: nSP70 (A), nSP300 (B) and mSP1000 (C). Scale bars: 0.1 mm (A) and 0.5 mm (B and C). (D and E) Size distribution of nSP70 (black), nSP300 (gray) and mSP1000 (dashed line) in water (D) or PBS (E) were measured by a dynamic light scattering method. Cosmetic products containing nSP, such as those used in skincare treatments, have been on the market for a considerable period of time. Adult human skin has an average surface area of 1.95 m2, weighs 3.18 kg and comprises over 300 million cells. The skin is the largest organ in the human body, which provides protection against heat, cold, electromagnetic radiation and chemical damage. Indeed, skin cells are likely to have the highest frequency of exposure to nSPs. Hence, a safety evaluation of nSPs using dermal cells is essential. Based on this consideration, using the HaCaT human keratinocyte cell line as a model system, we studied the effects of various sized silica particles on cell function. Specifically, we used HaCaT cells to perform the LDH release assay to assess membrane damage induced by silica particles. We found that membrane damage was not observed in nSP300- and mSP1000-treated HaCaT cells. 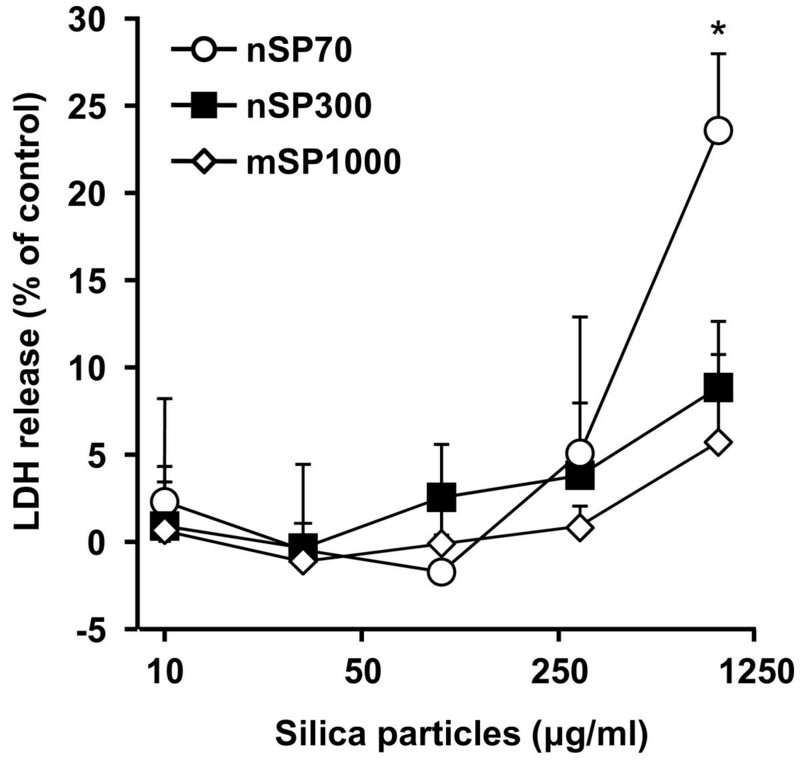 By contrast, LDH release increased after exposure of the cells to nSP70 in a dose-dependent manner (Figure 2). This observation suggested that membrane damage in keratinocytes increased significantly when the particle size was less than 100 nm. The decrease of particle size changes the physicochemical properties of the silica particles, such as surface area and the number of functional groups per particle weight, which are both increased [31–34]. In addition, subsequent experiments were performed at a non-toxic dose (less than 300 μg/ml) in order to exclude the toxic effects of nSP70. Effect of silica particles on membrane damage. Cellular membrane damage in HaCaT cells after incubation with nSP70 (circles), nSP300 (squares) and mSP1000 (diamonds) for 24 h was evaluated by the LDH release assay. The percentage cellular membrane damage was calculated relative to the negative (medium) controls. Data are presented as means ± SD (n = 3). *P < 0.01 vs same dose of nSP300 and mSP1000. Some reports have indicated that intracellular generation of reactive oxygen species (ROS) is induced by nSP [35–37]. Furthermore, it has recently been reported that crystalline silica induces intracellular ROS generation via NADPH oxidase activation following uptake by endocytosis [38, 39]. Based on these reports, ROS generation and DNA damage are an obvious means of assessing the hazard posed by nSP. Firstly, total intracellular ROS generation was measured in silica particle-treated HaCaT cells using 2'7'-dichlorodihydorofluorescein diacetate (DCFH-DA). Silica particles of all sizes were found to induce intracellular ROS generation in a dose-dependent fashion (Figure 3A). However, ROS generation by nSP70 treatment was significantly greater compared with nSP300 and mSP1000 treatment at the same particle concentration. Additionally, we confirmed that hydroxyl radicals, one of the most highly reactive ROS, were generated in HaCaT cells treated with silica particles, in particular with nSP70 (Figure 3B). Even in the 10 μg/ml-treated group, hydroxyl radical-generation effects of nSP70-treatment were 1.4 times higher than that of nSP300 and mSP1000-treated groups. These results suggested that silica particle-induced intracellular ROS generation was significantly increased by decreasing the particle size to less than 100 nm. ROS are defined as either "primary" or "secondary". Primary ROS (e.g. superoxide, O2 -) can be generated through metabolic processes or through the activation of oxygen, which results in the formation of a reactive nucleophilic molecule of oxygen i.e., superoxide anion. These reactive species may interact with other molecules, such as redox active transition metals (e.g. iron) or enzymes, resulting in the production of "secondary" ROS (e.g. •OH), which are primary mediators of DNA damage. Consequently, we analyzed the formation of 7'8'-dihydro-8-oxodeoxyguanosine (8-OH-dG) as an indicator of ROS-induced DNA damage. When HaCaT cells were treated with various concentrations of silica particles for 3 h, 8-OH-dG levels in nSP300- and mSP1000-treated cells remained constant regardless of silica particle dose and were equal to the levels found in untreated cells (Figure 3C). By contrast, 8-OH-dG levels increased upon exposure of the cells to nSP70 in a dose-dependent manner. After treatment with nSP70 at 90 μg/ml the level of 8-OH-dG increased significantly compared with non-treated cells. Detection of oxidative stress induced by silica particle treatment in HaCaT cells. Detection of total ROS and hydroxyl radical induced by silica particle treatment in HaCaT cells. HaCaT cells were incubated with various concentrations of nSP70 (circles), nSP300 (squares), and mSP1000 (diamonds) for 3 h. (A) Total ROS induced by treatment with silica particles were expressed as relative fluorescence units in the DCFH assay. *P < 0.01 vs same dose of nSP300 and mSP1000. (B) Hydroxyl radical was measured by hydroxyphenyl fluorescein (HPF) assay. Data shown are means ± SD (n = 3). *P < 0.01 vs same dose of nSP300 and mSP1000. (C) Detection of 8-OH-dG induced by silica particle treatment in HaCaT cells. HaCaT cells were incubated with 10, 30 or 90 mg/ml nSP70, nSP300, or mSP1000, and As2O3 (positive control) for 3 h. Data shown are means ± SD (n = 3). *P < 0.01, **P < 0.05. (D and E) Effects of ROS inhibitor on DNA strand breaks induced by silica particle treatment in HaCaT cells. HaCaT cells were pretreated with 2 mM N-acetylcystein (NAC) for 30 min (NAC + nSP70) or nSP70 alone, prior to incubation with 90 mg/ml nSP70 for 3 h. As a positive control, HaCaT cells were treated with 0.2 mM H2O2 for 3 h. (D) Column height shows the tail length. (E) Column height shows the tail moment. Data shown are means ± SD of at least 16 cells per sample. Results shown are representative of more than three independent experiments. *P < 0.01. 8-OH-dG is known as a major index of oxidative DNA damage related to mutagenesis, carcinogenesis and the aging process [40, 41]. These reports, together with our results, suggest the possibility that nSP70 may be carcinogenic. Moreover, nSP-induced ROS may induce genotoxicity via DNA strand breaks, oxidative DNA damage and mutation. Indeed, DNA damage was detected in nSP70-treated HaCaT cells. In addition, nSP70-mediated DNA damage was inhibited by pre-treatment with the ROS scavenger, N-acetylcystein (NAC) (Figure 3D and 3E). From the results of the present study, we suggest that ROS play an important role in cellular responses such as nSP-induced DNA damage. However, the reason why ROS generation varies with particle size has not yet been clarified. Fine or ultrafine particulate matter (PM), such as diesel exhaust particles or crystalline silica, often induces ROS generation that contributes to the induction of DNA damage or apoptosis. Although the mechanisms underlying the PM-induced oxidative stress response remains unclear, strong evidence supports PM phagocytosis as a stimulus for increased oxidative stress via NADPH oxidase activation [38, 42, 43]. In addition, Walee Chamulitrat et al. reported that HaCaT cells constitutively express Nox components Rac1, p40phox, and p67phox proteins . In HaCaT skin keratinocyte cells, stimuli such as epidermal growth factor, Ca2+-ionophore A23187, lysophosphatidic acid are capable of producing ROS [45–47]. Thus, one potential candidate for the nSP70-mediated DNA damage is ROS, which is produced by NADPH oxidase upon nSP70 phagocytosis. In order to assess the relationship between the uptake pathway and ROS generation, we measured the production of ROS induced by nSP70 in the presence or absence of a specific inhibitor of endocytosis. After treatment with cytochalasin D, an inhibitor of actin polymerization , ROS generation induced by nSP70 was measured by DCFH-DA assay. Results indicated that ROS generation induced by nSP70 was inhibited by pretreatment with cytochalasin D in a dose-dependent manner (Figure 4). Furthermore, nSP70-induced DNA damage was also significantly reduced by pretreatment with cytochalasin D (Figure 5A and 5B). These findings suggest that the silica particles entered the cells mainly through actin-mediated endocytosis, such as the macropinocytosis pathway, thereby inducing ROS generation and DNA damage. It is well-known that NADPH oxidase, which exists in the cytosol, cellular membrane and subcellular compartment membranes, becomes activated and generates ROS after ingestion of microorganisms into the phagosome and/or endosome [49–51]. Moreover, it is reported that TiO2 particles induce IL-1ß production by NADPH oxidase-mediated ROS generation in the human macrophage cell line . Likewise, NADPH oxidase exists in the cytosol and membranes of non-phagocyte cells, including HaCaT cells . Additionally, it had been reported that inflammasomes are activated by actin-mediated endocytosis of crystalline silica, which lead to NADPH oxidase activation and ROS generation [38, 39, 53]. Consequently, in order to determine the role of NADPH oxidase in silica particle-induced ROS generation, the effects of pretreatment with the NADPH oxidase inhibitor, apocynin, a well-known NOX inhibitor [49, 54], were investigated. As expected, nSP70-induced ROS generation was inhibited in the presence of apocynin (Figure 4). In contrast, DNA damage induced by nSP70 was not inhibited by pretreatment with apocynin (Figure 5C and 5D). Taken together, these results suggest that nSP70-mediated DNA damage was induced by ROS generated by an unknown mechanism, and not via NADPH oxidase. Nox1 activation may initiate large bursts of ROS that can mediate the killing of pathogens, such as H. pylori . Thus, NOX1 activation has been implicated in the cutaneous innate immunity to bacterial infections of the skin. A more detailed evaluation of the mechanism that underlies nSP70-mediated NOX activation is essential. Nonetheless, based on our results and the work of others, we speculate that nSP70s are treated almost like pathogens by HaCaT cells. Effects of endocytosis and NADPH oxidase inhibitor on generation of ROS induced by silica particle treatment. HaCaT cells were pretreated with cytochalasin D or apocynin for 30 min prior to incubation with 270 mg/ml nSP70 for 3 h. ROS induced by silica particle treatment were expressed as relative fluorescence units, which means that ROS intensity of each silica particle alone and non-treatment is 100 and 0 respectively, in the DCFH assay. Data shown are means ± SD (n = 3). *P < 0.01, **P < 0.05. Effects of endocytosis and NADPH oxidase inhibitor on DNA damage by silica particle treatment. Effects of endocytosis inhibitor (A and B) or NADPH oxidase inhibitor (C and D) on DNA strand breaks induced by silica particle treatment in HaCaT cells. (A and B) HaCaT cells were pretreated with 10 mM cytochalasin D (Cyto D) for 30 min (Cyto D + nSP70) or nSP70 alone, prior to incubation with 90 mg/ml nSP70 for 3 h. (C and D) HaCaT cells were pretreated with 40 mM apocynin (Apo) for 30 min (Apo + nSP70) or nSP70 alone, prior to incubation with 90 mg/ml nSP70 for 3 h. As a positive control, HaCaT cells were treated with 0.2 mM H2O2 for 3 h. (A and C) Column height shows the tail length. (B and D) Column height shows the tail moment. Data shown are means ± SD of at least 16 cells per sample. Results shown are representative of more than three independent experiments. *P < 0.01. A number of mechanisms underlie the ability of nanoparticles to cause DNA damage. As mentioned above, a key mechanism that is often described is the ability of particles to cause the production of ROS [32, 56]. One possible mechanism of particle-mediated DNA damage is the ability of particles to stimulate target cells to produce oxidants/genotoxic compounds e.g., by affecting mitochondrial electron transport, activation of NADPH oxidase, or inducing cytochrome P450 enzymes. Our results show that nSP70-mediated DNA damage of HaCaT cells occurred via a mechanism that did not involve NADPH oxidase. Alternatively, transition metal ions (such as cadmium, chromium, cobalt, copper, iron, nickel, titanium and zinc) released from certain nanoparticles have the potential to cause the conversion of cellular oxygen metabolic products such as H2O2 and superoxide anions to hydroxyl radicals, which is one of the primary DNA damaging species. Well-known examples of the consequences of metal ion-contamination in relation to nanotoxicity have been described for carbon nanotubes. Indeed, iron contaminants in CNT have been shown to result in a substantial loss of glutathione and increased lipid peroxidation in alveolar macrophages, indicators of oxidative stress . However, our data suggests that the nSPs used in this study, nSP70, nSP300 and mSP1000, were not contaminated with metal ions (data not shown). Thus, it is highly unlikely that metal ion contamination is involved in nSP70-induced DNA damage. Another hypothesis is that the size of nSPs is related to its oxidative stress. As particle size decreases, the particle unit of mass and overall surface area increases. This larger surface area enhances catalytic activity. Indeed, it has been widely reported that increased surface area of these particles increases reactivity because surface atoms have a tendency to possess high energy bonds. In order to gain stabilization, these surface bonds will readily react with other molecules . The specific surface area was calculated by means of the following equation; s = 6/dρ (where s, specific surface area (m2/g); ρ, density (g/cc); d, diameter (μm)). The specific surface area of nSP70, nSP300 and mSP1000 calculated using this equation was 43, 10 and 3 m2/g, respectively. When specific area is considered, rather than particle concentration, the membrane damage activity of nSP70 and nSP300-treated cells shows almost the same level of LDH release per unit surface area (data not shown). In terms of ROS generation and DNA oxidation, nSP70 is more potent than nSP300. These results suggest that nSP70, which possesses a larger specific surface area compared to the counterpart micron-sized silica particles, has a much greater chance of interaction with biomolecules. 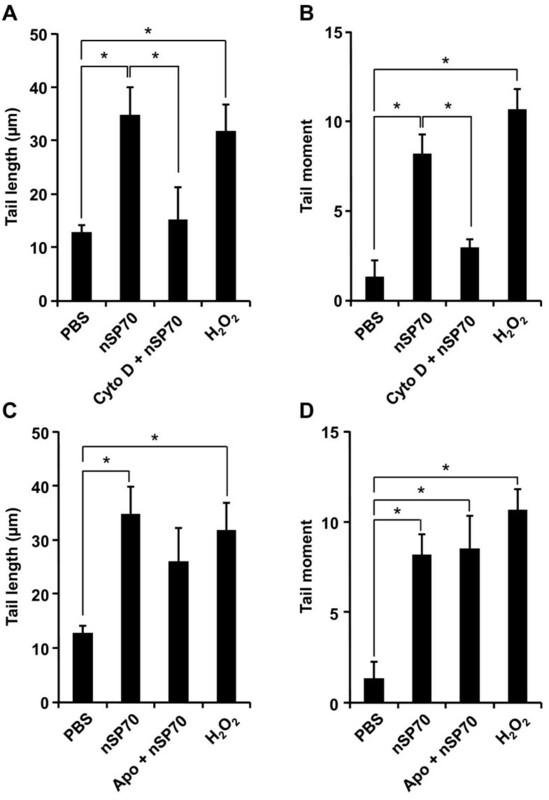 Consequently, nSP70 causes direct cellular damage and promotion of oxidative stress. In addition to these hypotheses, nanoparticles may gain direct access to DNA via nuclear transport. However, this mechanism seems very unlikely given that the nuclear pore complex is known to be 8-30 nm in diameter, depending on cell type . Nonetheless, some studies have reported that nanoparticles can penetrate the nuclear membrane, such as silica nanoparticles (40-70 nm) . Detailed analysis of the mechanism of DNA damage induced by nanoparticles is currently underway. This information will be a critical determinant in the design of safer nSPs and will provide valuable information for hazard assessment of nSPs. Here, we report the effects induced by well-dispersed amorphous silica particles (nSPs) on human keratinocyte (HaCaT) cells. In addition to our own work, other studies have shown that well-dispersed nSPs induce cytotoxicity, including LDH release, in a dose-dependent and size-dependent manner using a macrophage cell line [61, 62]. On the other hands, Lin et al. reported that nSPs mediated cytotoxicity/DNA damage against A549 cells were not correlated with particle size . Further, Barnes et al. reported that nSP induce no genotoxicity in fibroblast 3T3-L1 cells. From the viewpoint of nSP-mediated toxicity, there is no consistency in these four reports including our findings. As mentioned above, there are a number of examples in the literature of conflicting results regarding nSPs. It has becoming increasingly evident that the physicochemical properties of nanomaterials, such as the size, shape, surface charge, fabricating method, etc, play a central role in governing their cellular uptake and subsequent physiologic consequences. Furthermore, experimental conditions, such as cell type and incubation time, are critical for the nanotoxicologic studies. Hence, given the inconsistencies it is difficult to draw the same conclusions. However, our results using well-dispersed nSPs indicated that nSPs were more cytotoxic and genotoxic against the human keratinocyte cell line HaCaT. In this study, we show that nSP induce certain cellular responses, such as ROS generation and DNA damage. By contrast, their bulk-sized counterparts display a much reduced response. These different responses might be partly due to different mechanisms, such as intracellular uptake and ROS generation. We speculated that receptor-mediated uptake was involved in these phenomena and set out to identify the physicochemical properties that affect receptor endocytosis. We believe a detailed analysis of nSP-internalization will be invaluable for both hazard assessment and the design of safe nSPs. Suspensions of fluorescent (red-F)-labeled amorphous silica particles (Micromod Partikeltechnologie GmbH) (25 mg/ml and 50 mg/ml) were used in this study; particle size diameters were 70, 300 and 1000 nm (designated as nSP70, nSP300 and mSP1000, respectively). Silica particle suspensions were stored in the dark at room temperature. The suspensions were sonicated for 5 min and then vortexed for 1 min immediately prior to use. The HaCaT human keratinocyte cell line was kindly provided by Dr. Inui , Osaka University. HaCaT cells were cultured in Dulbecco's modified Eagle's medium (D-MEM) supplemented with 10% heat-inactivated fetal bovine serum and 0.2 mM L-glutamine. The cells were grown in a humidified incubator at 37°C (95% room air, 5% CO2). Silica particle suspensions were diluted to 0.25 mg/ml (nSP70), 0.5 mg/ml (nSP300 and mSP1000) with water or PBS, respectively and the average particle sizes were then measured using the Zetasizer Nano-ZS (Malvern Instruments Ltd). The mean size and the size distribution of silica particles were measured by a dynamic light scattering method. The size and shape of silica particles were determined using scanning electron microscopy (SEM). Each silica particle suspension was dropped on the sample stage and dried. The dried silica particles were then observed by SEM. Lactate dehydrogenase (LDH) is released from HaCaT cells exposed to nSP70, nSP300 or mSP1000. The LDH activity of the supernatant of the culture medium was determined using a commercial LDH cytotoxicity test (WAKO, Japan) according to the manufacturer's instructions. In brief, 5 × 103 cells were seeded into each well of a 96-well plate. After 24 h incubation, cells were treated with nSP70, nSP300, mSP1000 or 0.2% Tween 20 (positive control). After a further 24 h incubation period, 50 μl of medium overlying cells was used for LDH analysis. Absorption of light at 560 nm was measured using a spectrophotometer. The generation of total intracellular ROS was measured by monitoring the increasing fluorescence of 2'7'-dichlorofluorescein (DCF). The cell-permeant 2'7'-dichlorodihydorofluorescein diacetate (DCFH-DA; Sigma, St. Louis, MO) enters the cell where intracellular esterases cleave off the diacetate group. The resulting DCFH is retained in the cytoplasm and oxidized to DCF by ROS. Hydroxyl radical was measured by monitoring the increasing fluorescence of hydroxyphenyl fluorescein (HPF; SEKISUI MEDICAL Co., Ltd., Japan). 3 × 104 HaCaT cells were seeded into each well of a 96-well plate. After 24 h incubation, cells were treated with nSP70, nSP100, nSP300, mSP1000 or 2 mM H2O2 (positive control). Cells were then washed once with phenol red-free medium, and incubated in 100 μl working solution of DCFH-DA or HPF (10 μM) at 37°C for 30 min. Using the fluorescence reader (ARVO MX; Perkin Elmer, Waltham, MA), the fluorescence of DCF or HPF was monitored at the excitation and emission wavelengths of 485 nm and 530 nm or 490 nm and 515 nm, respectively. HaCaT cells were seeded on a 100 mm dish. After 24 h, cells were treated with various concentrations of nSP70, nSP300, mSP1000, 0.2 mM H2O2 (positive control) or PBS (negative control). After 3 h, cellular DNA was isolated using DNeasy tissue kit (QIAGEN, Germany). Ten μg of DNA was converted to single stranded DNA by incubation with 180 U Exonuclease III (Takara Biotech., Japan) at 37°C for 1 h. The DNA was heated at 95°C for 5 min, rapidly chilled on ice, and digested to nucleosides by incubation with 0.6 U nuclease P1 (Takara) at 37°C for 1 h followed by treatment with 0.6 U E. coli alkaline phosphatase (Takara) for a further 1 h. The reaction mixture was centrifuged (6000 × g for 1 min) and the supernatant used for the 8-OHdG assay. The amount of 8-OHdG was measured according to the protocol of the competitive ELISA kit (8-OHdG check; Japan Institute for the Control of Aging, Japan). 3 × 104 HaCaT cells were pretreated with 2 mM N-acetylcystein (NAC, ROS scavenger), 10 mM cytochalasin D (endocytosis inhibitor) or 40 mM apocynin (NADPH oxidase inhibitor) for 30 min prior to incubation with 90 mg/ml of nSP70 for 3 h. As a positive control, HaCaT cells were treated with 0.2 mM H2O2 for 3 h. DNA strand breaks were detected by alkaline comet assay according to the Comet Assay Kit (Trevigen, Gaithersburg, MD). The samples were processed according to the protocol provided in the kit. Twenty-five cells on each slide, randomly selected by fluorescence microscopy, were then analyzed using the Comet Analyzer (Youworks Corporation, Japan). HaCaT cells were pretreated with various concentration of cytochalasin D (Merck Ltd., Germany) for 30 min prior to incubation with 270 mg/ml nSP70 for 3 h. ROS induced by treatment with silica particles were expressed as relative fluorescence units in the DCFH-DA assay as described above. Statistical comparisons between groups were performed by one-way ANOVA and a Bonferroni post hoc test. The level of significance was set at P < 0.05. This study was supported in part by Grants-in-Aid for Scientific Research from the Ministry of Education, Culture, Sports, Science and Technology of Japan, and from the Japan Society for the Promotion of Science (JSPS). This study was also supported in part by Health Labour Sciences Research Grants from the Ministry of Health, Labor and Welfare of Japan; by Health Sciences Research Grants for Research on Publicly Essential Drugs and Medical Devices from the Japan Health Sciences Foundation; by a Global Environment Research Fund from Minister of the Environment; and by a the Knowledge Cluster Initiative; and by Food Safety Commission; and by The Nagai Foundation Tokyo; and by The Cosmetology Research Foundation; and by The Smoking Research Foundation. HN and TY designed the study. HN, KM, YN, STo, SK, TH and TA performed experiments. HN and TY collected and analysed data. HN and TY wrote the manuscript. KN, YA, YY, HK, NI and STs gave technical support and conceptual advice. YT supervised the all of projects. All authors discussed the results and commented on the manuscript.